The proper maintenance of trucks is what ensures the safety of truck drivers and other car drivers on the road. Because semi-trucks can weigh up to 80,000 pounds when they are fully loaded, it is essential to make sure that they are properly maintained and secure. If these truckloads are not secured, then it may be possible for a truck’s belongings to fall off the commercial vehicle and hit other cars. Catastrophic accidents result when truck drivers and companies do not take necessary precautions to maintain equipment. This negligence results in unsafe trucks on the road that pose a hazard to all drivers. The federal government has also addressed the need for proper maintenance of trucks in the commercial trucking industry. It is now possible for car drivers to file lawsuits against trucking companies when they fail to maintain equipment and cause accidents as a result. If you were injured in a trucking accident due to a failure to maintain the cargo, speak with a personal injury lawyer who can represent your side of the story today. You may be entitled to receive monetary compensation, and a personal injury lawyer who has experience with truck accidents can help you pursue the recovery you are entitled to receive. Under the federal regulations administered by the Federal Motor Carrier Safety Administration (FMCSA), one must continuously inspect and maintain records for each vehicle in a trucking business. The FMCSA is administered by the U.S. Department of Transportation and was created in 2000. Its sole purpose is to provide for the safety of truck drivers and car drivers. To meet this goal, the Administration has enacted hundreds of regulations to ensure that truck drivers utilize the best safety practices in driving on the road. Inadequate truck maintenance common cause of trucking accidents, and it is why regulations governing maintenance have been codified into law. Under FMCSA Regulation §396.11, truck companies must maintain accurate inspection reports for their vehicles. Upon completion of a single’s day work, a truck driver is expected to fill out an inspection report under this statute’s language. The report should be very detailed, and it must cover equipment like the service brakes, parking brakes, steering wheel, lights on the truck, tires, horn, windshield wipers, rear vision mirrors, wheels, rims and emergency equipment on the truck. Each equipment piece listed in this statute must be maintained in proper condition because it is critical to fostering safe driving habits. If the windshield wipers are in disrepair, this could cause a truck driver to not see anything through the windshield in the event of a storm or heavy rain. If the tires are not in proper condition, then a truck driver could be at risk for being involved in a jackknife accident. 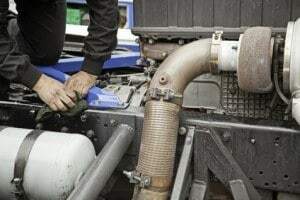 The unfortunate reality is that many pieces of equipment in disrepair go unnoticed because a truck driver or company fails to complete required inspection reports. If you have been involved in a truck accident and were seriously injured, then you should speak with a lawyer today for help in investigating whether these inspection reports were ever completed. If there are no records to indicate the condition of a truck, then this violation of §396.11 may be enough to confer liability on the trucking company. Filing a negligence claim against commercial trucking companies for personal injuries can be a complicated task. It is often the case that trucking companies are well-prepared to face litigation and have hired lawyers to deal with claims like a failure to maintain. It is vital that you hire a lawyer who is as equally prepared to enter into legal battle with these companies. You should consider whether a lawyer has extensive knowledge of the FMCSA regulations and knows how to assert them in a negligence claim. You can stand up for your legal rights today with help from truck accident lawyers. Call Rosenfeld Injury Lawyers LLC today to schedule an initial consultation and learn whether you may qualify for damages in the form of medical expenses, pain and suffering, loss of consortium and lost wages. Our lawyers have experience in investigating unsafe trucks and the factors that have lead to their inadequate maintenance. Contact us at 888-424-5757 today!